I’ve yet to see a robin, but the grass is greening up and while they haven’t bloomed, my tulips have broken ground. My rancher friends are up at all hours dealing with newborn calves and lambs. Best of all, the days are warm enough that you don’t mind being outside for more than a few minutes. It’s SPRING in northern Montana! To celebrate, I have a fun little crocus block for you. To construct this block, we need to make 2.5″ x 4.5″ “split rectangles”. 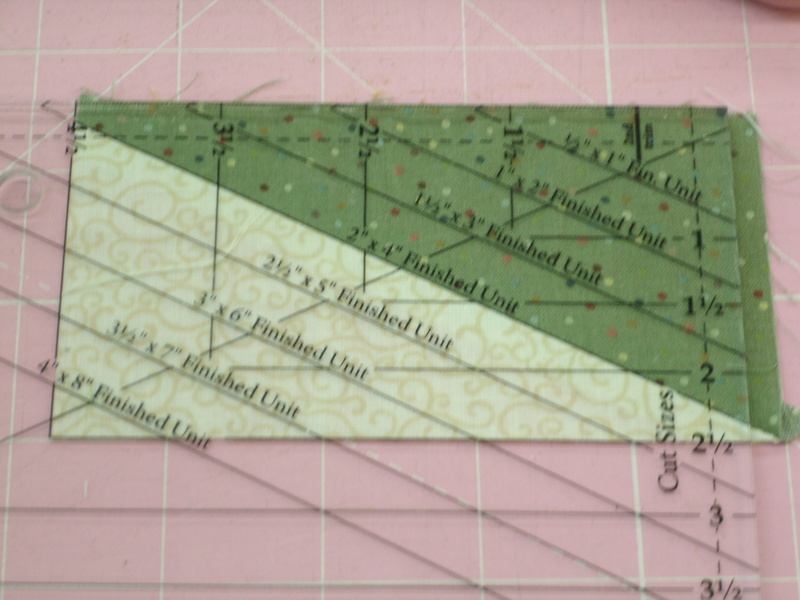 Because we are starting with our pre-cut 2.5″ x 4.5″ rectangles, this is going to be a little tricky, and you will find that the diagonal seam line will not go into the corner of the finished piece. If you’re compulsive about accuracy, this may drive you a little crazy, but it’s okay. Trust me. 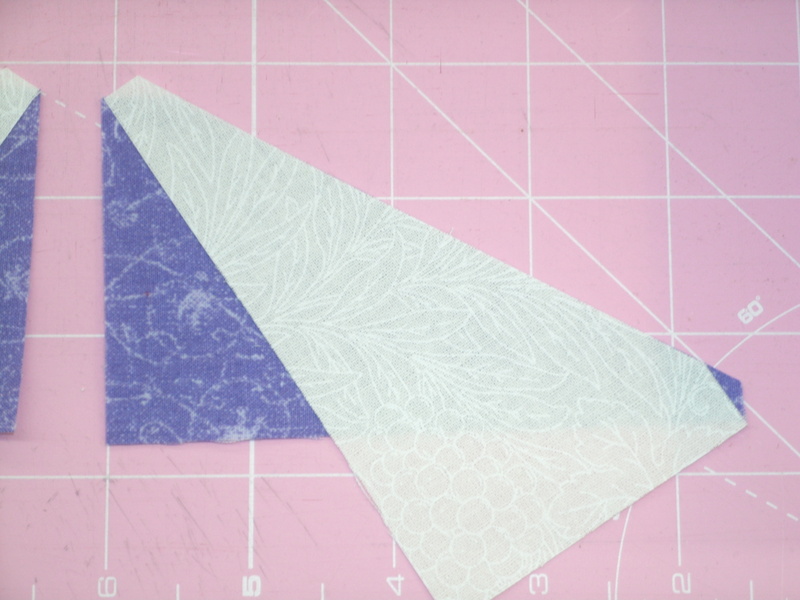 Layer your two print rectangles wrong sides together, so you will be cutting mirror-image pieces. 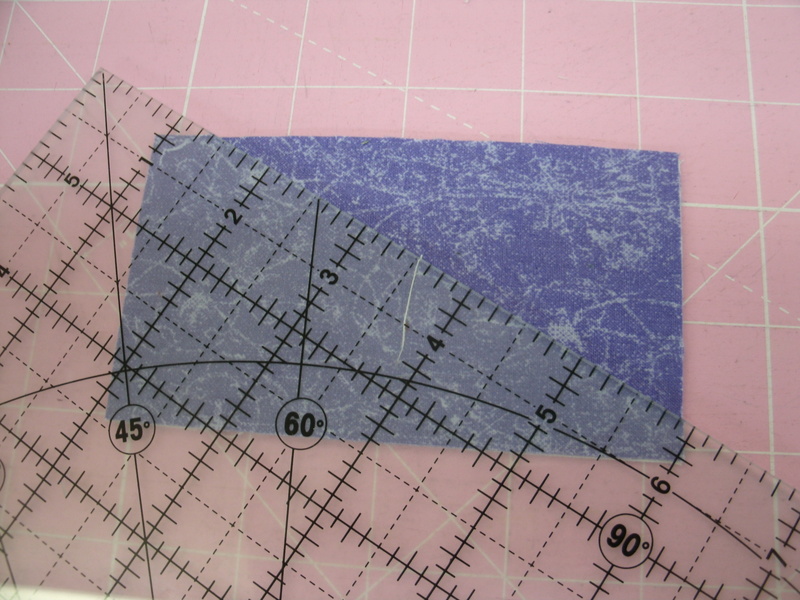 Lay your ruler diagonally on the fabric so that the 1/4″ line is on the upper left and lower right corners as shown. Make your cut. Discard the cutaway triangle. Repeat with the green and white rectangles. 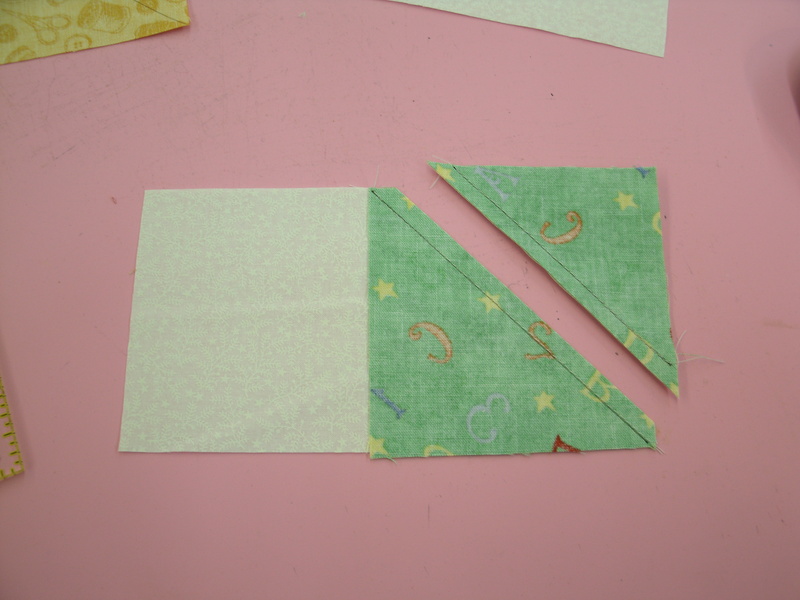 Pair a white piece with each print piece and place them right sides together as shown. matching the original corners and aligning the bias edges. Your seam line should run from corner to corner. Press open and you should have 2.5″ x 4.5″ rectangles again. 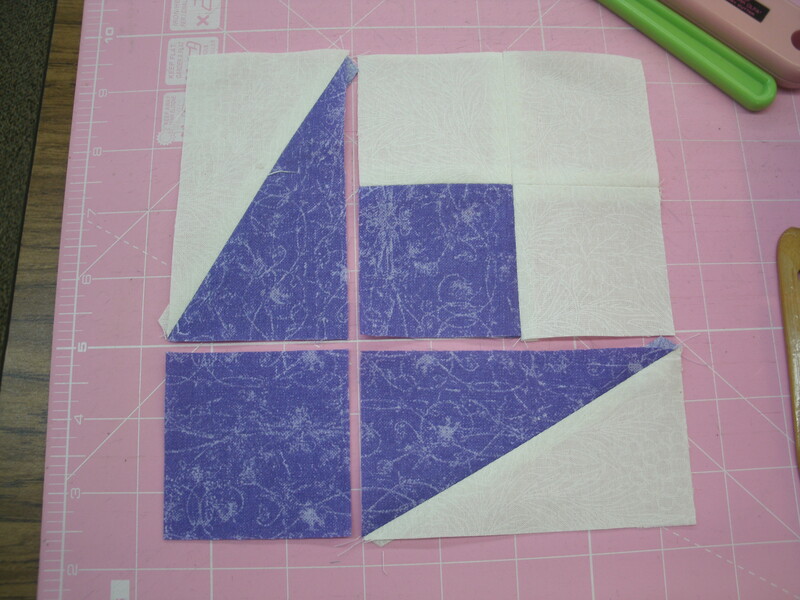 Make a 4-patch with one 2.5″ print square and three 2.5″ white squares. Now you can lay out all of the pieces for the crocus “blossom” as shown and sew them together. Once the blossom portion is finished, it’s time to add the leaves. 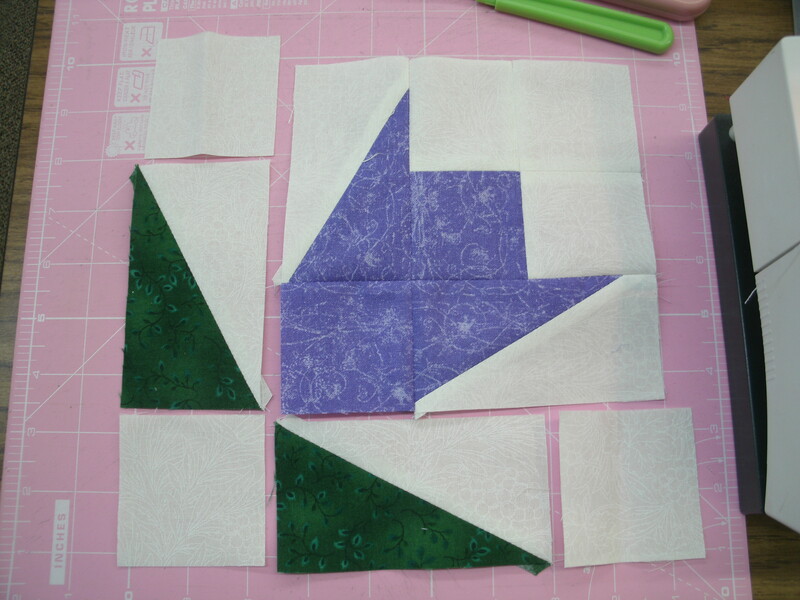 Lay out the green split rectangles and the three remaining white 2.5″ squares as shown. 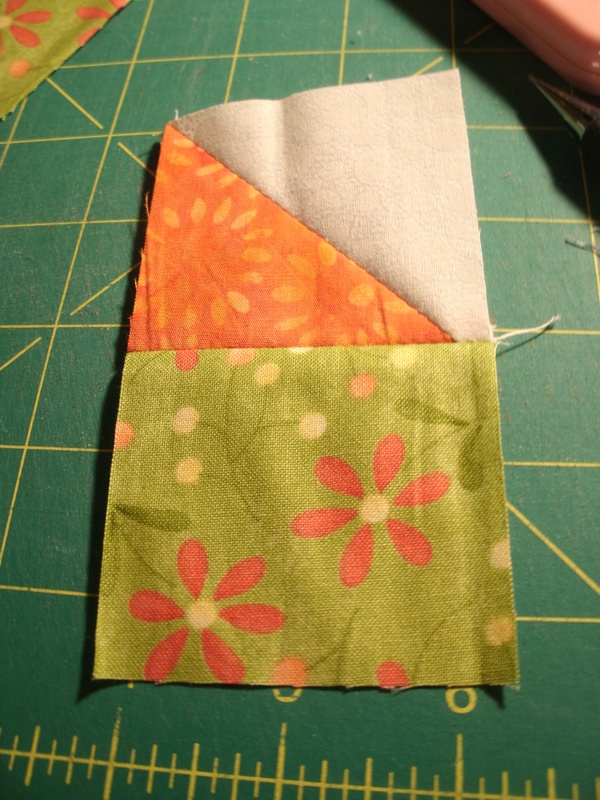 Sew a white square to the narrow green end of one leaf and sew that unit to the side of the blossom unit. 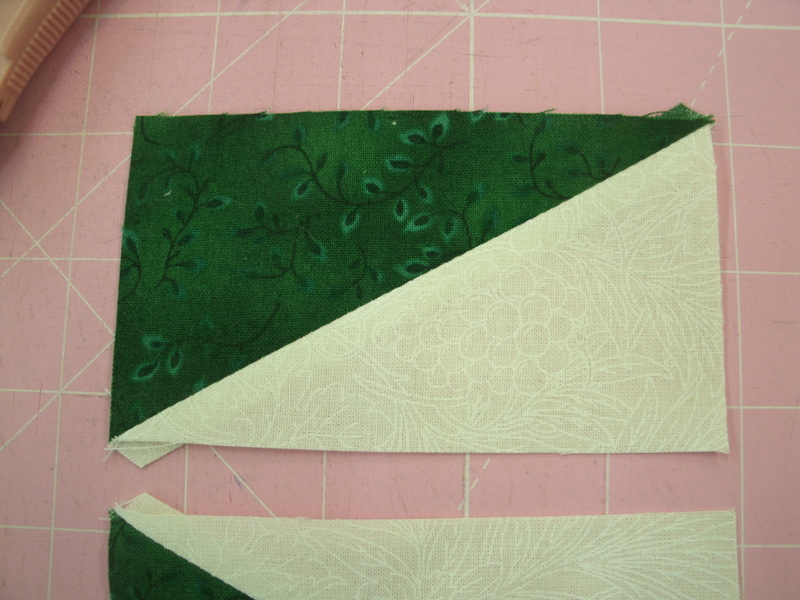 Then sew white squares to both ends of the other leaf and sew that unit on to complete your crocus block. Perhaps you can see in the photo that the diagonal purple seam lines wind up about 1/4″ away from the corner of that rectangle. Also, the tips of the green triangles that touch the purple blossom unit are just a bit “flat”. Because it doesn’t affect the outline of the flower, and because it happens consistently in this block, it doesn’t bother me like I was sure it would. If you’re uncomfortable with it, I have another way to make those split rectangles that will solve the problem. Meet me here next week, when we’ll “plant” some morning glories! 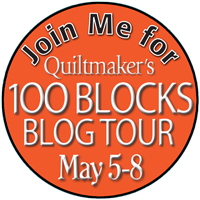 Oh, and mark your calendar for Tuesday, May 5th when “Seams Like a Plan” will be a stop on Quiltmaker magazine’s 100 Blocks, Vol. 11 blog tour. One reason I have a lot of unfinished projects cluttering up my studio is that I suffer from ADDD…Attention Deficit Designing Disorder. Too often a project in progress is interrupted by an idea that just flutters into my brain. Most dash off before I can grab a paper and pencil, but now and again one settles in and makes itself at home. This is one of those ideas. 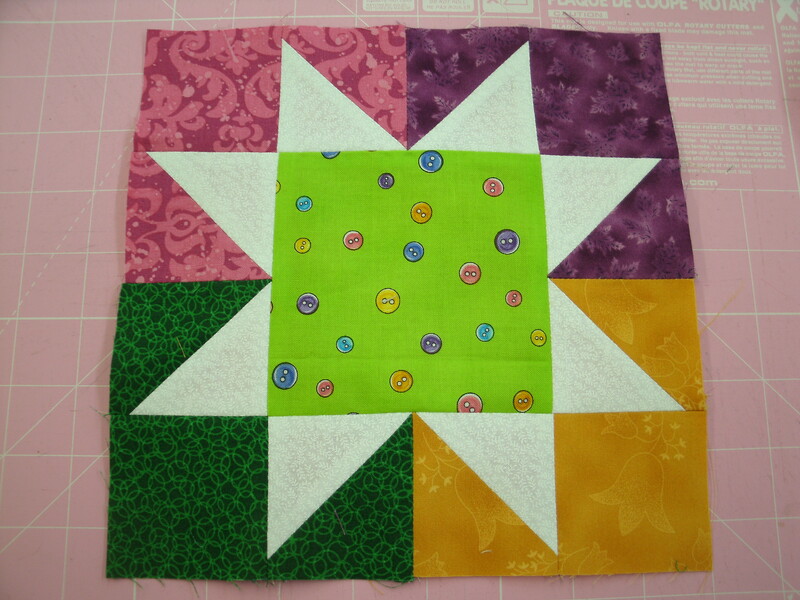 A couple of weeks ago I posted a tutorial for my “Quarter Star” block. Since then, I have been working on a blog series that should begin next Month. Well, sir, the two ideas collided and formed a new block. I had to stop and whip one up. 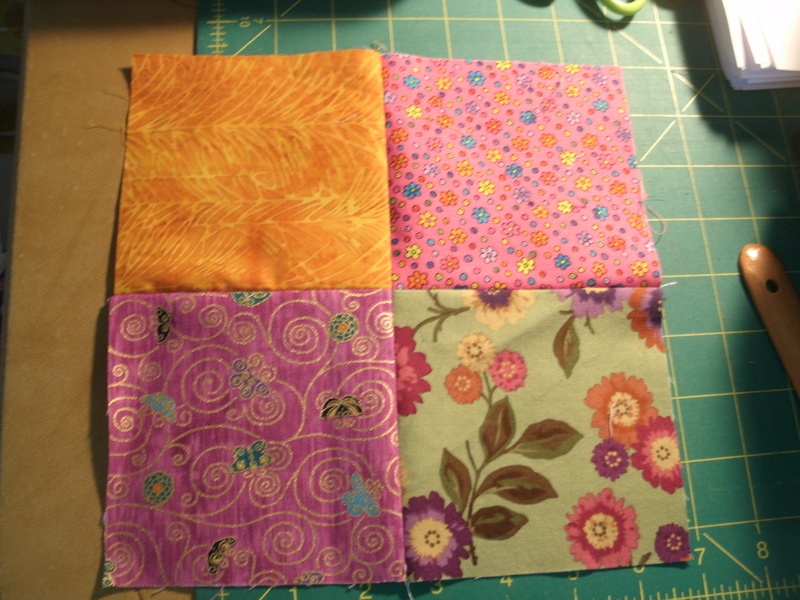 I used 2.5″ and 4.5″ squares and made an 8″ (finished size) block. For a 12″ block, use 3.5″ and 6.5″ squares. 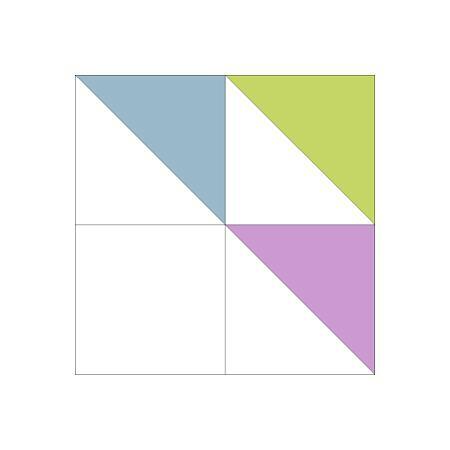 Draw a diagonal line on the back of each of the small white squares. 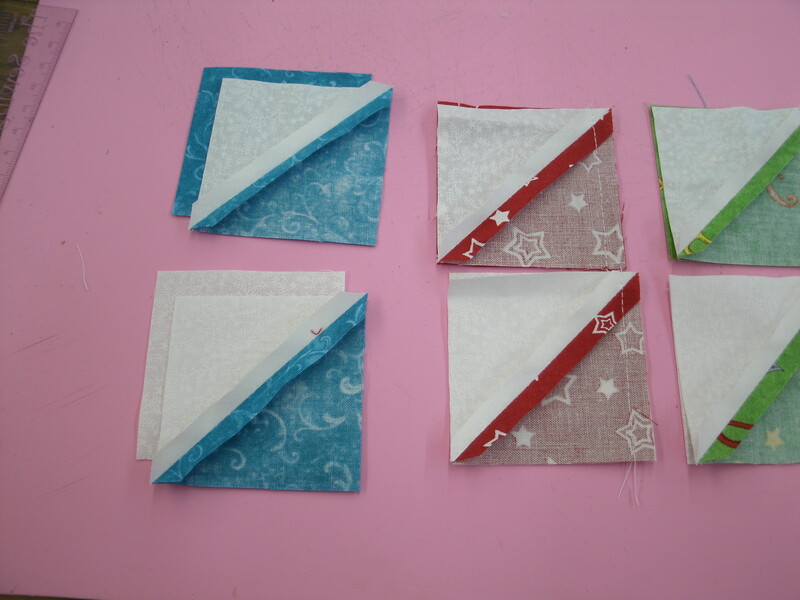 Pair each with a small print square and make four pairs of half-square triangles (HST’s), using the “stitch and flip” method. 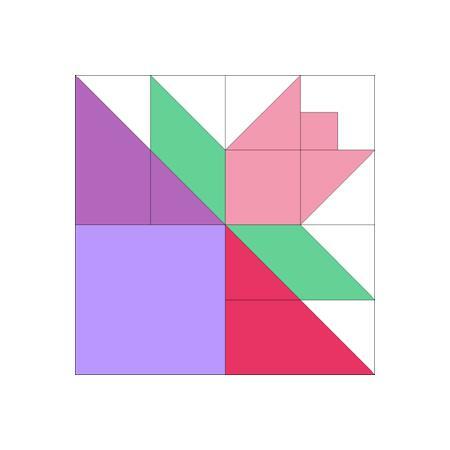 You will have one small square of each color remaining, plus your large square. Lay out all of the parts as shown, so that your HST’s form star points around the large center square. Sew the HST’s into pairs. 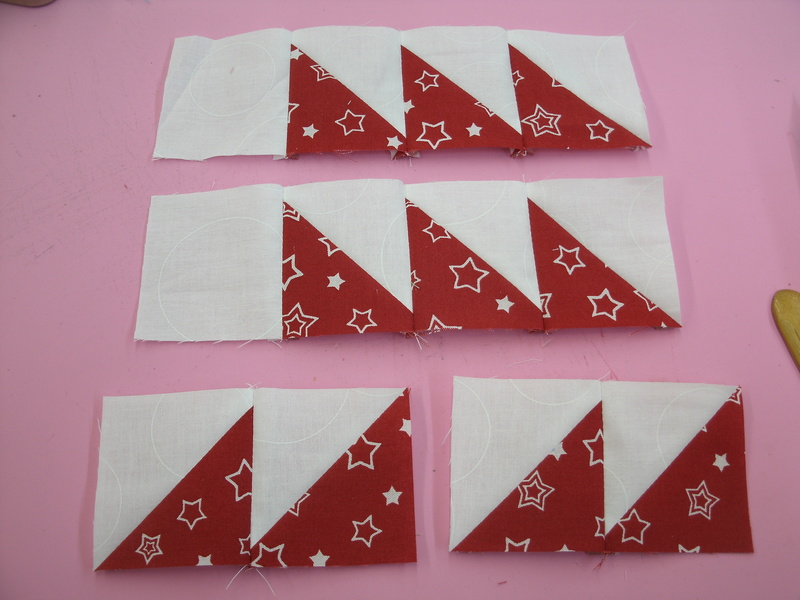 Now you can sew the remaining small squares to the ends of the top and bottom star point pairs. 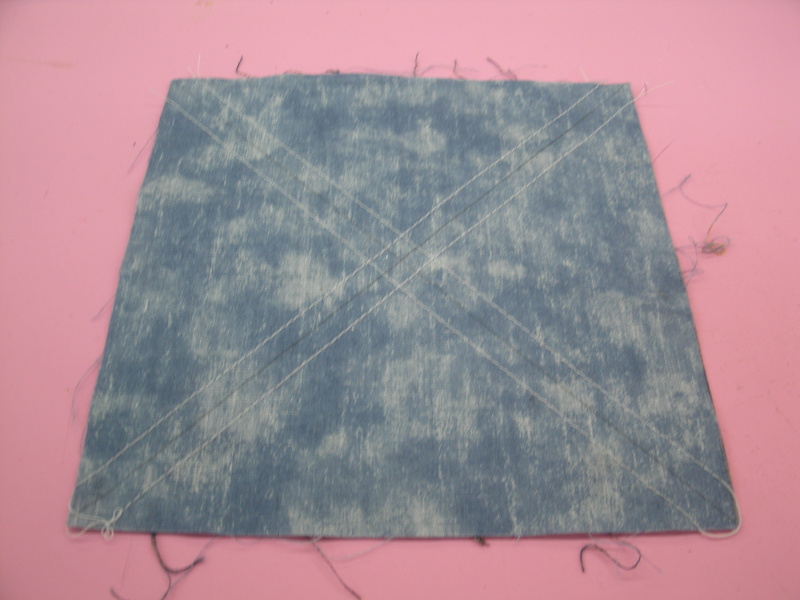 Sew the other star point pairs to the large center square. Please give me your best idea in a comment, below. When we make Flying Geese in the Thrifty Quilter system, we use the “stitch and flip” method- two small squares and a rectangle equals one “goose”. Of course, this method leaves us with small “waste” triangles. You can use those, you know. Draw a diagonal line on the back of your 3.5″ square, and a second line 1/2″ from the first line. Sew on both lines. Trim the corner 1/4″ from the first line. 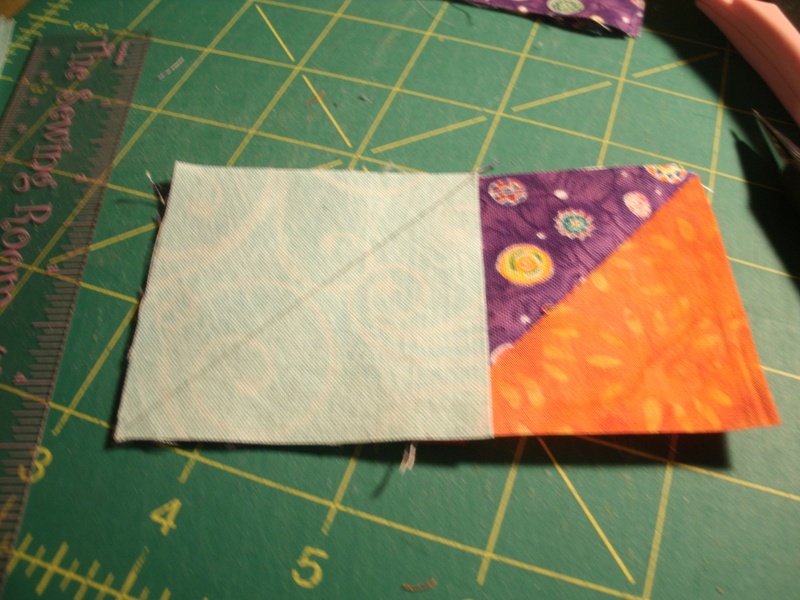 Press seam open and repeat on the other end of the rectangle. 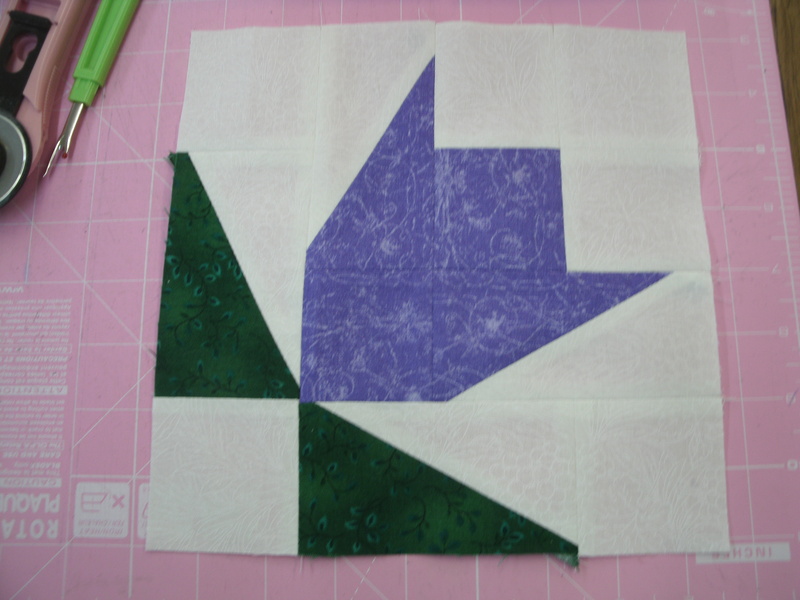 I now have the “goose” for my project, and two HSTs that can go into my 2.5″ squares bin. 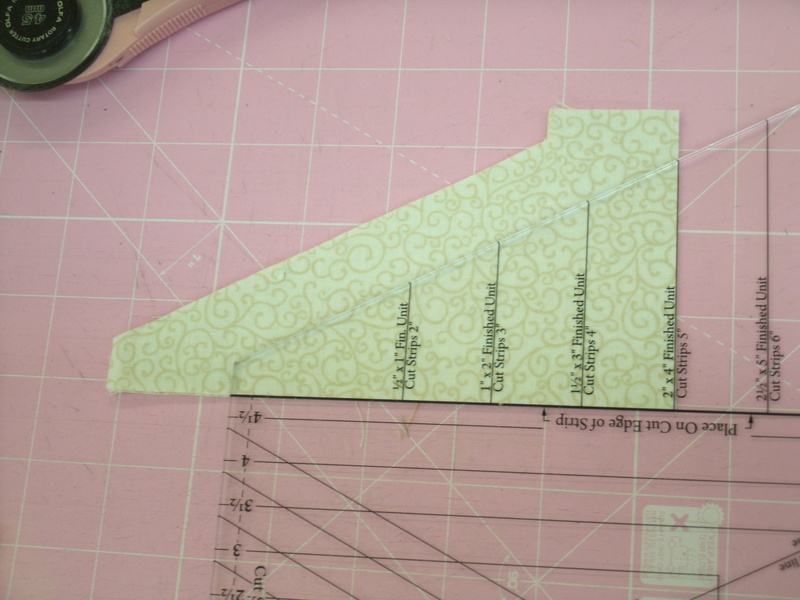 These HSTs are just a little too big, and need to be trimmed down. Many square rulers have a 45 degree line that goes into a corner. 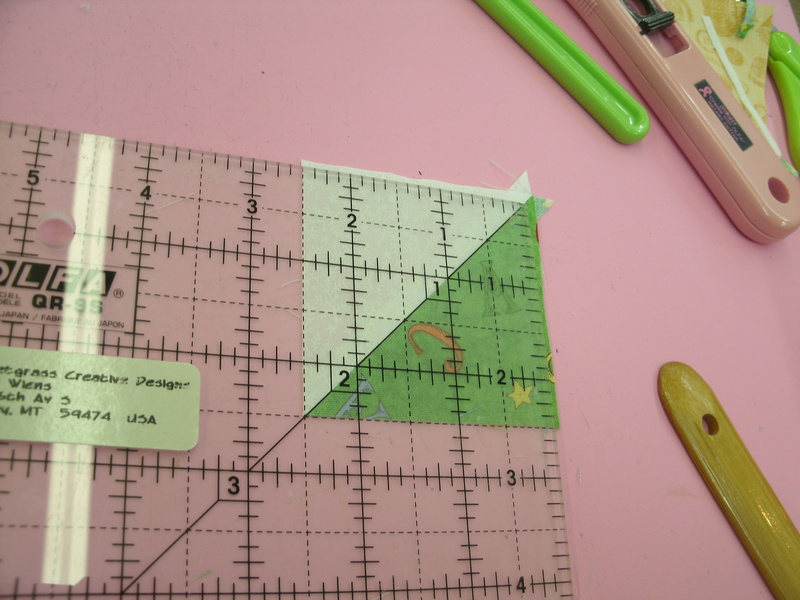 Lay your ruler down so that the 45° line is on the diagonal seam. The left and bottom edges of the square extend past the 2.5″ lines on your ruler. Trim the right and top edges. 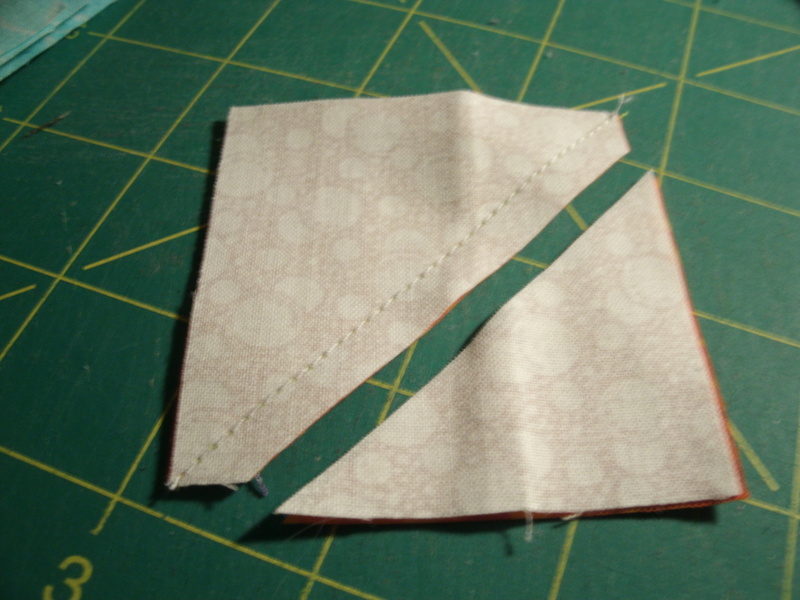 Flip the HST around and place the diagonal line on the seam again. This time the left and bottom edges should be right on your 2.5″ lines. Again, trim the right and top edges. 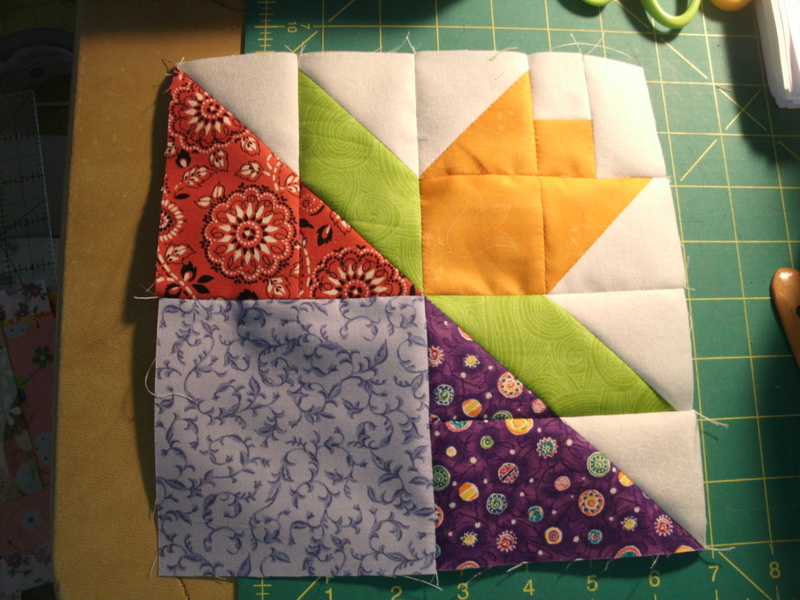 For this block you need four pairs of HST’s, one 2.5″ square that matches each pair, and four white 2.5″ squares. 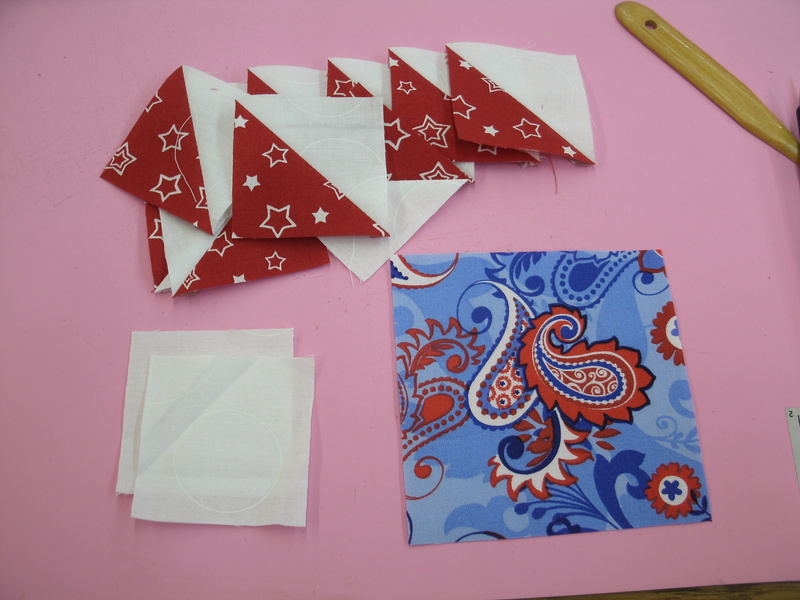 For each pair of HSTs, sew one to a matching square and the other to a white square. Notice the orientation of the diagonal seams in the photo. All of the HSTs must look the same going through your machine. 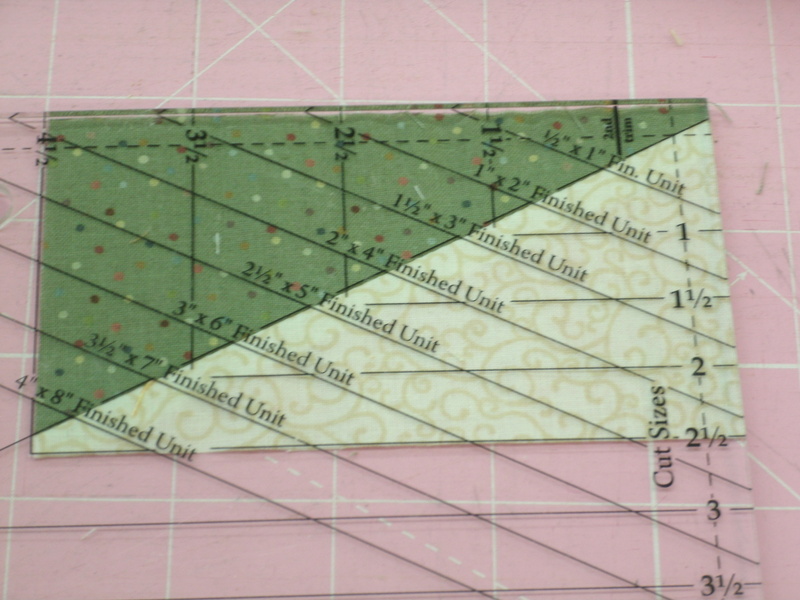 Now you can sew those pairs together to make four “point” units. 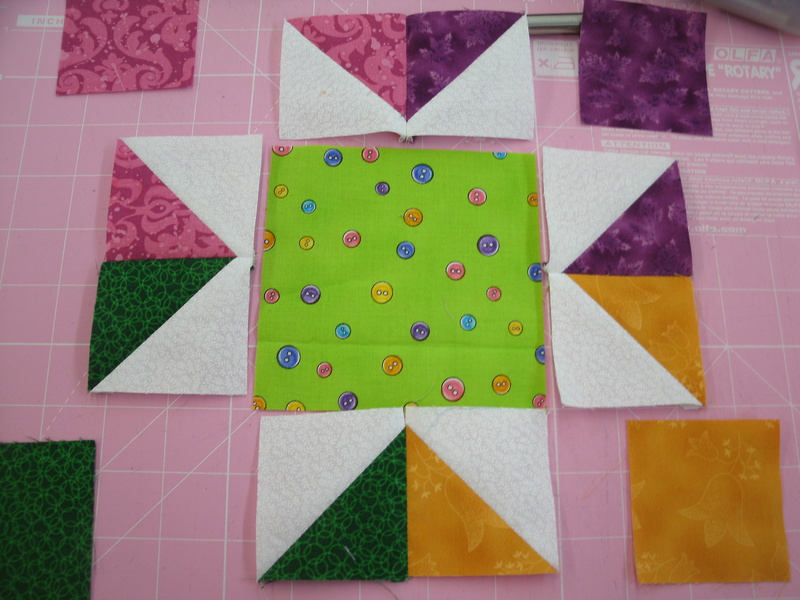 Then sew the points together to complete your “All Points” block. 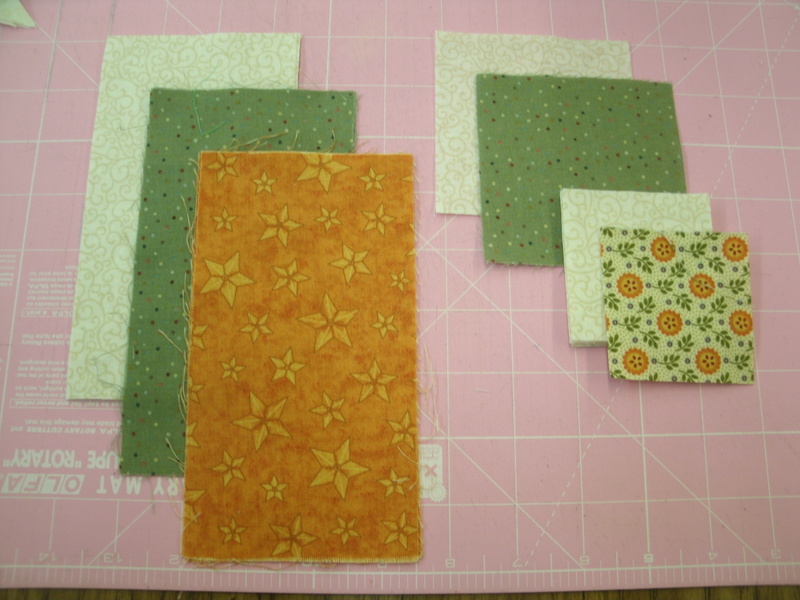 For this block you need ten matching HSTs, plus two 2.5″ white squares and one 4.5″ print square. 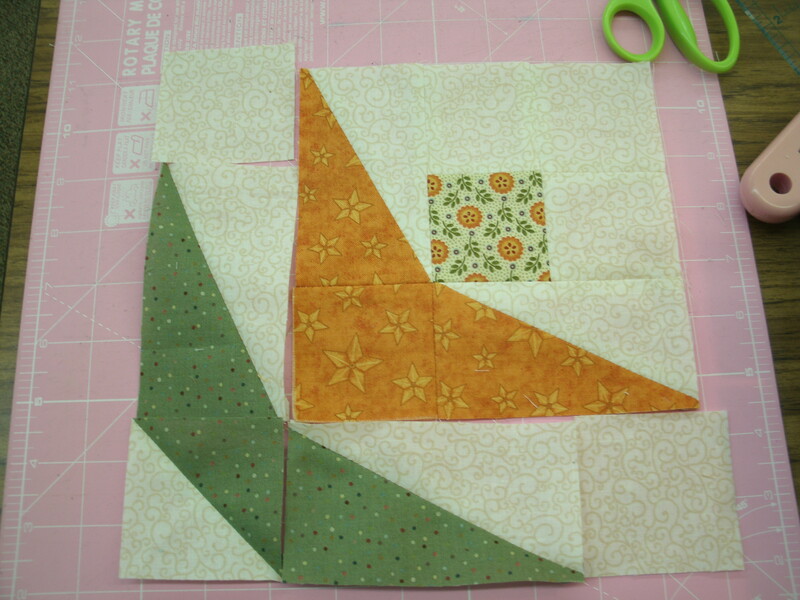 This block is a good choice for “fussy cut” 4.5″ squares. 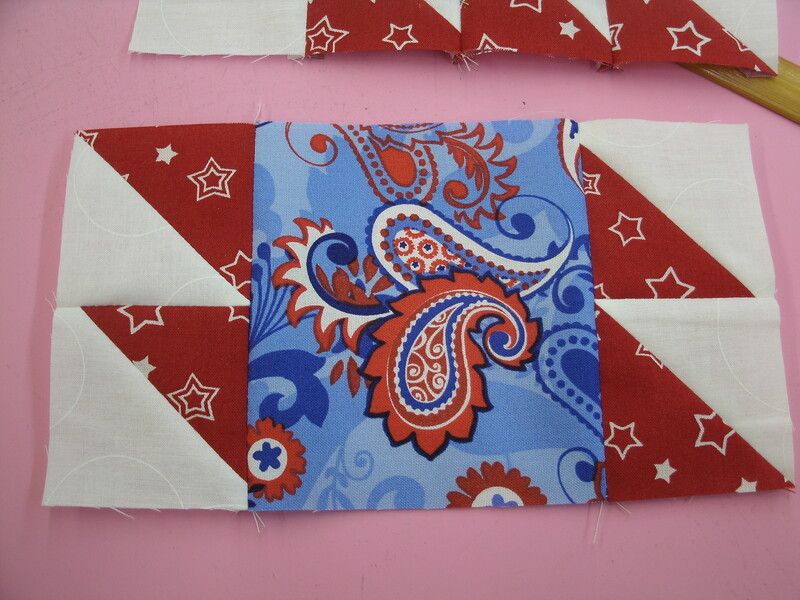 Sew two strips with three HST’s and one white square. Notice that the HSTs “point” to the right. 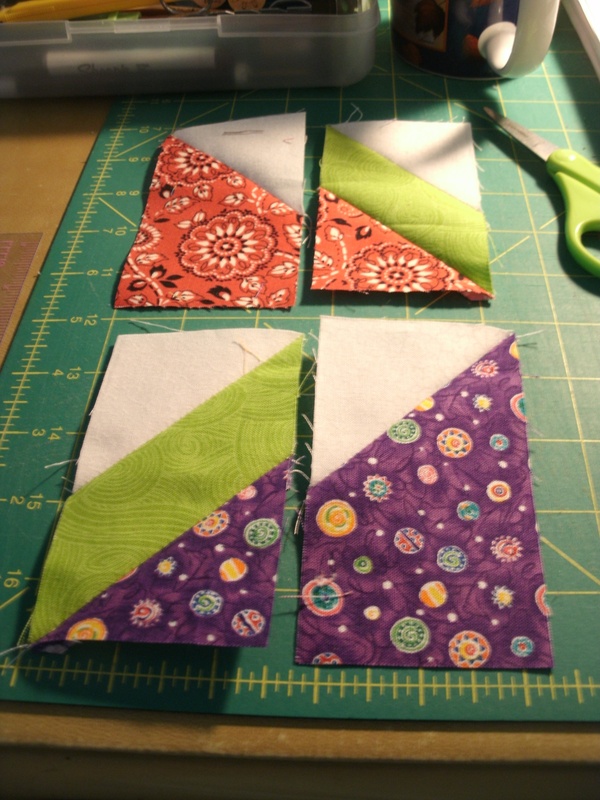 Sew two pairs of HSTs. Notice that the pairs “point” to the left. 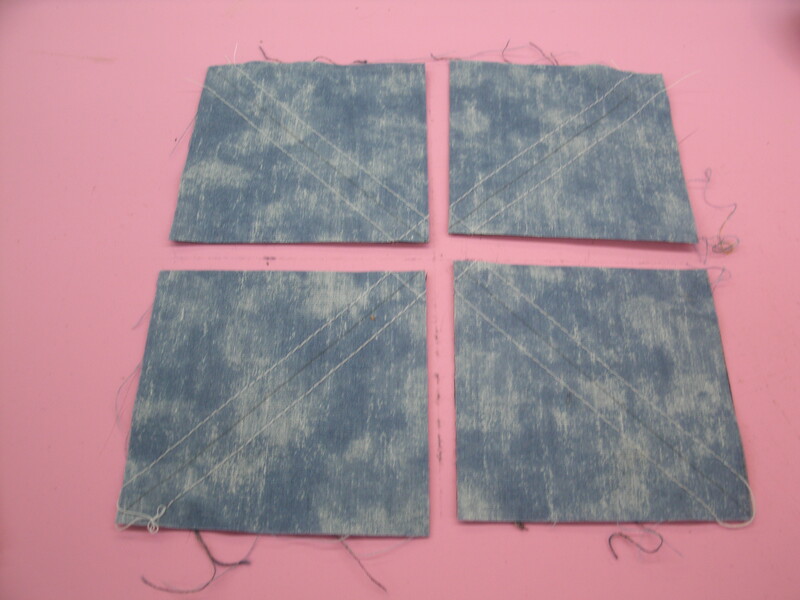 Sew the HST pairs to the left and right sides of the 4.5″ square. 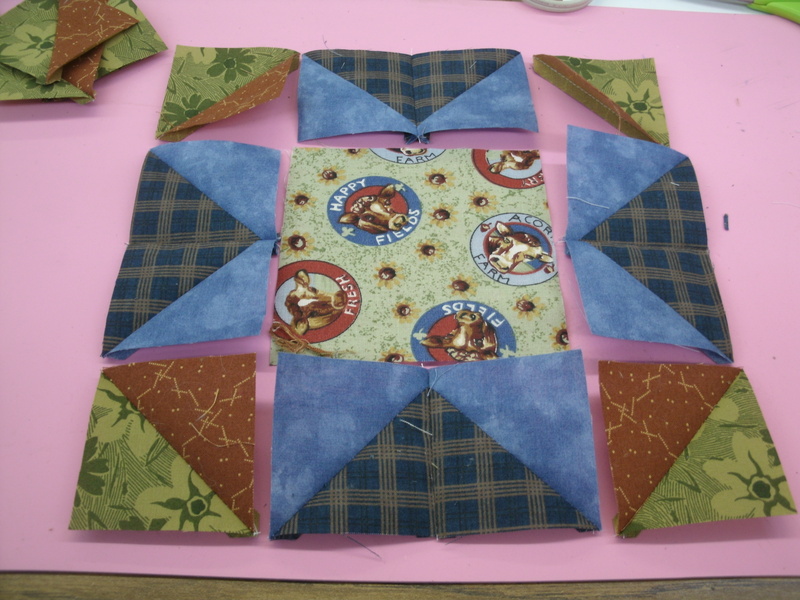 Now sew the strips to the top and bottom to complete your “Rocky Mountain” block. 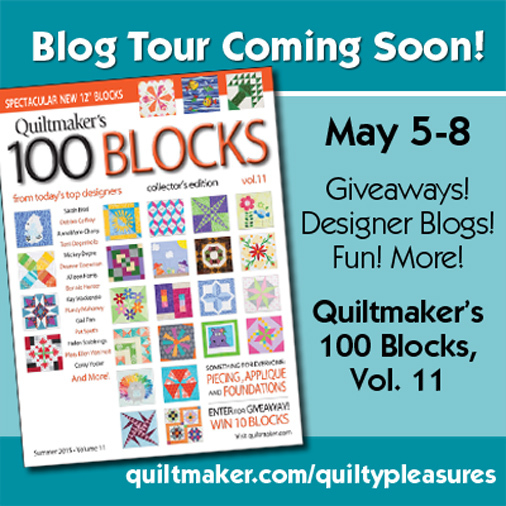 Remember- Quiltmaker’s 100 Blocks, Vol. 9 hits newsstands on May 6th, and includes a brand new totally TQable block. Watch this blog for a sneak peak sometime during the week of April 28th! 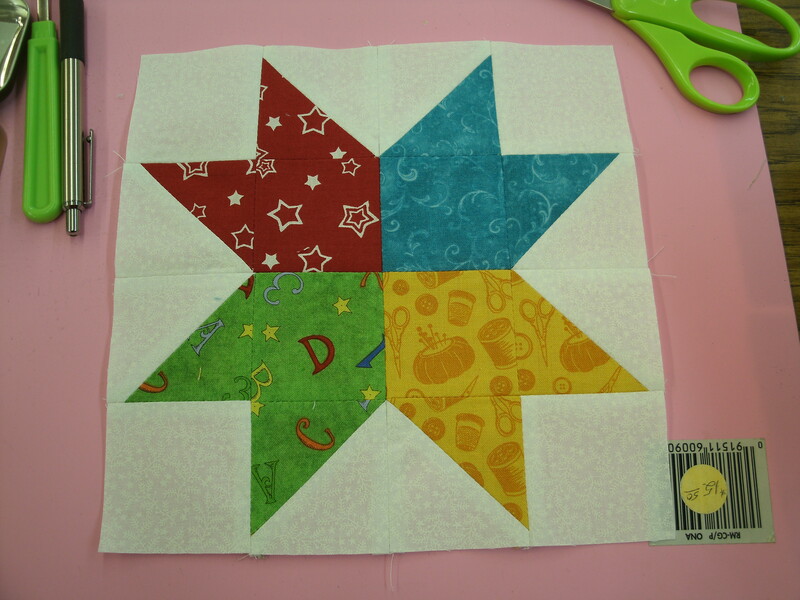 The other day I was playing with a Thrifty Quilter (TQ) pattern idea using a variation of the Sawtooth Star. 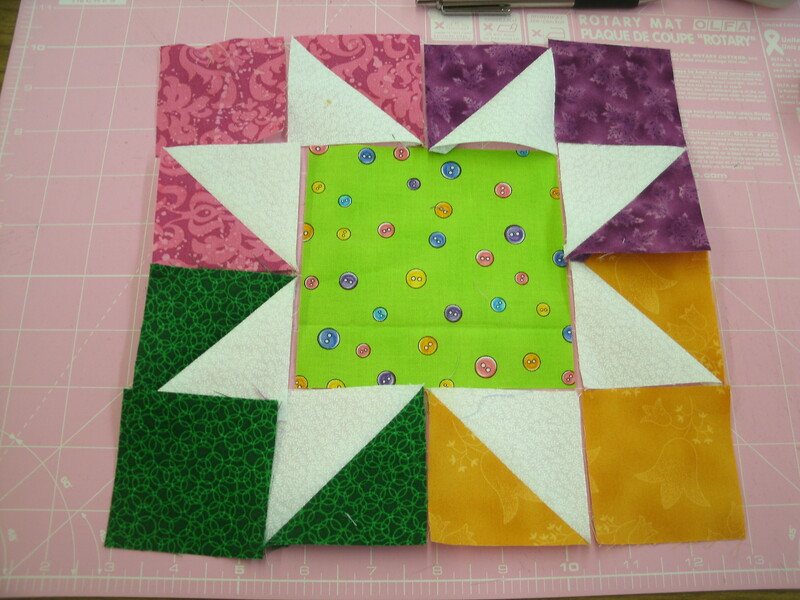 This block requires eight 2.5″ squares for the star points. Unfortunately, I didn’t have very many sets of eight matching squares left in my 2.5″ bin. Now, my self-imposed rule is that I can only buy one fabric for any TQ quilt I make, and for this one, that fabric was for the setting triangles and binding. What to do? 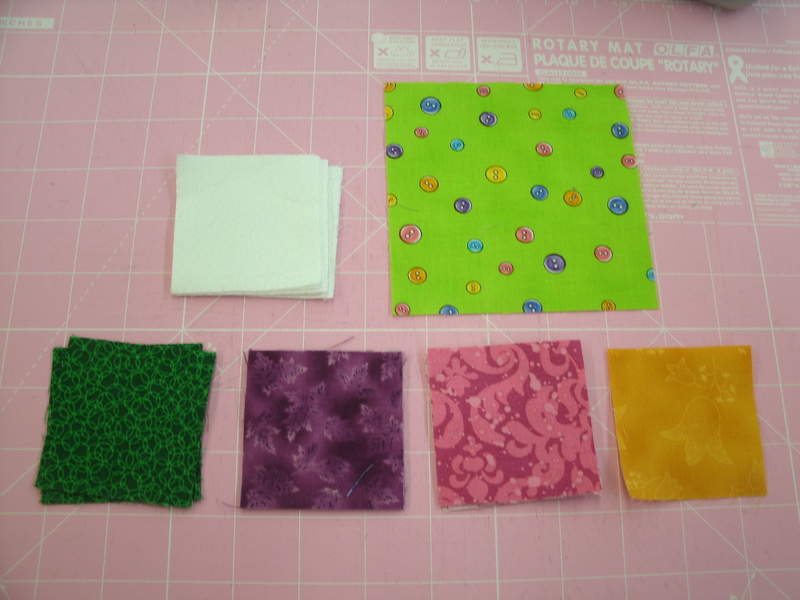 I thought about cutting up a few fat quarters that I had been saving for some project I haven’t thought of yet. That’s how stashes get out of hand, by the way. “Oh, I can’t use that piece. I’m saving that for a special project” is just one of the excuses I’ve used to justify a trip to the fabric store for “just a little bit” of the “right” color. Of course, I never take the fabric I’m trying to match along, so I come home with several “little bits” in various shades. Hence, my one-fabric rule. Okay, back to the point. 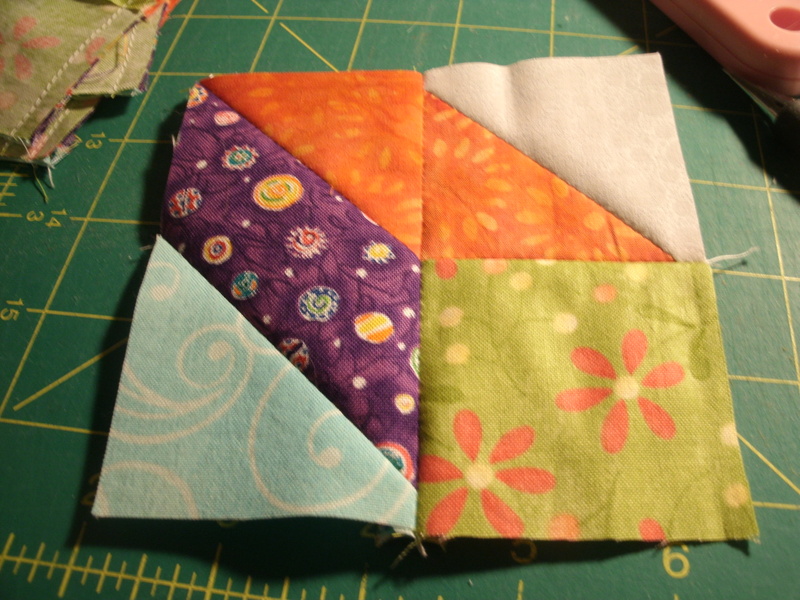 I happened to come across a small stack of 6″ squares left over from a guild exchange. Then I remembered my bin of 6.5″ TQ pieces. 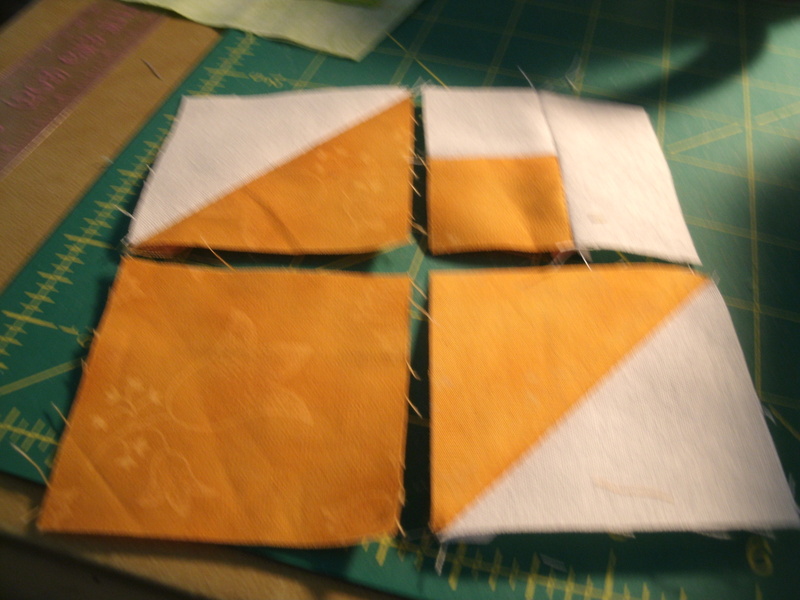 Step 1: Pair light and dark 6″ or 6.5″ squares, right sides together. 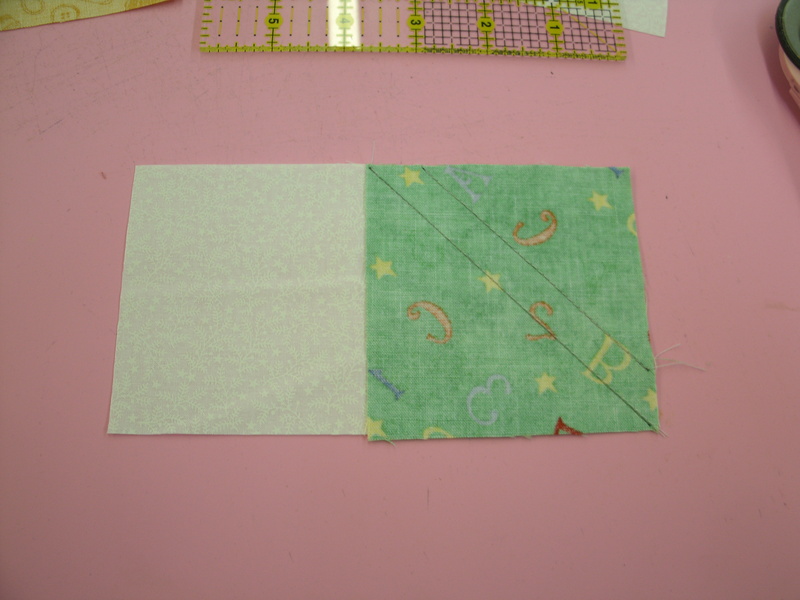 Draw two diagonal lines on the back of the lighter square and sew 1/4″ on each side of both lines. Cut the square in half vertically, and horizontally. 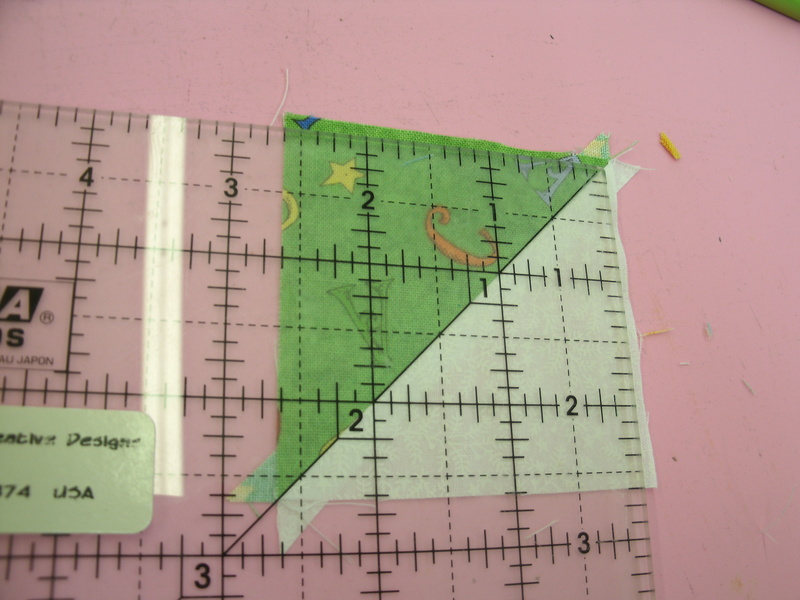 Note: The photos show a 6″ square being cut into 3″ squares. If you start with 6.5″ squares, you would cut them into 3.25″ squares. Now cut each of the small squares on the drawn diagonal line. I like to press my seams open. You can press to the darker fabric if you want to. Because these HST’s are larger than we need, we will trim them down to 2.5″. We did this in the “Overflowing Scrap Basket” blog post. Click HERE to go to that post. Now we can sew pairs of these HST’s together to make the four flying geese units we need for the sawtooth stars! 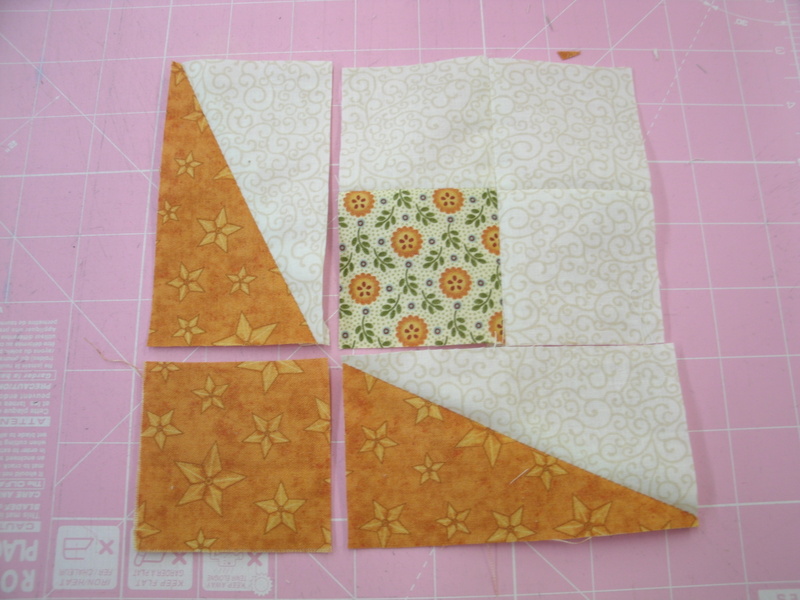 To complete each block, you will need a 4.5″ square for the center, and four more HST’s for the corners. Notice I have four HST’s leftover from this second pair of 6″ squares. Those four HST’s went into a second block! 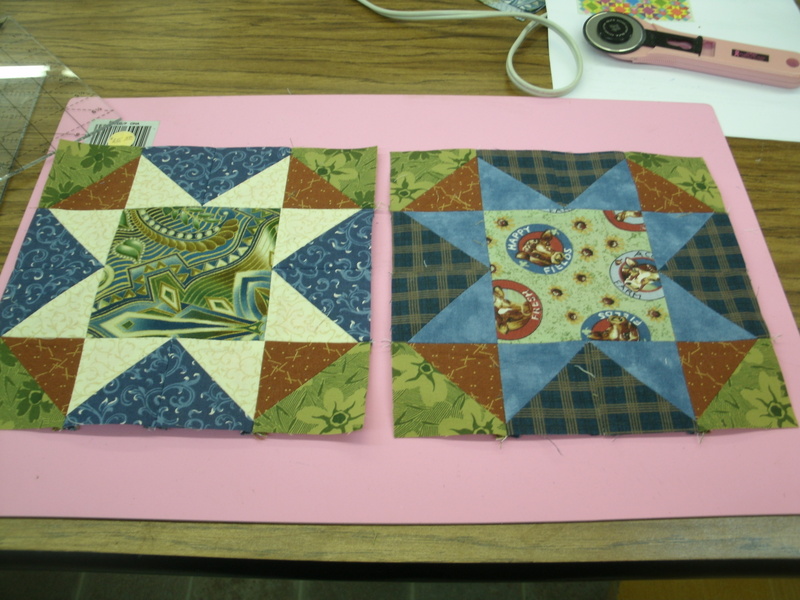 So two 4.5″ squares and six 6″ (or 6.5″) squares will give me two 8″ star blocks. 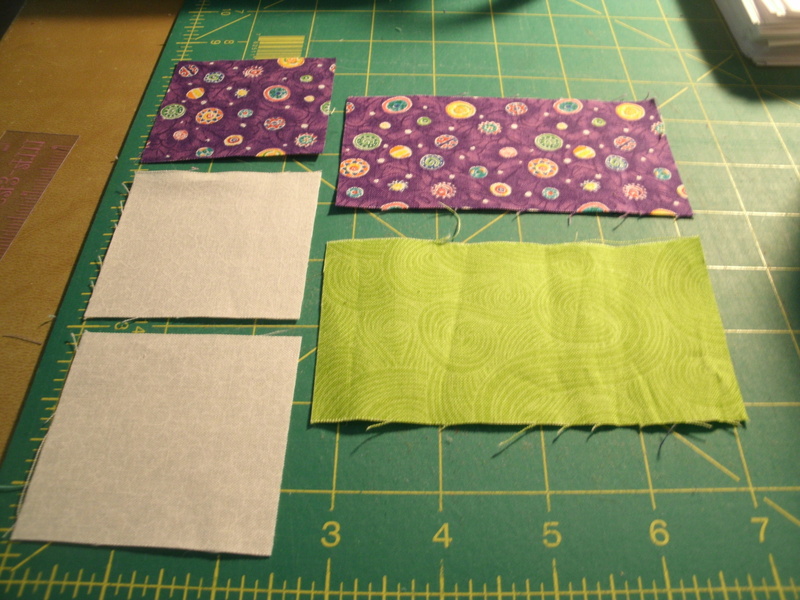 The quilt I have in mind for these blocks will require 32 blocks for a crib-size quilt. 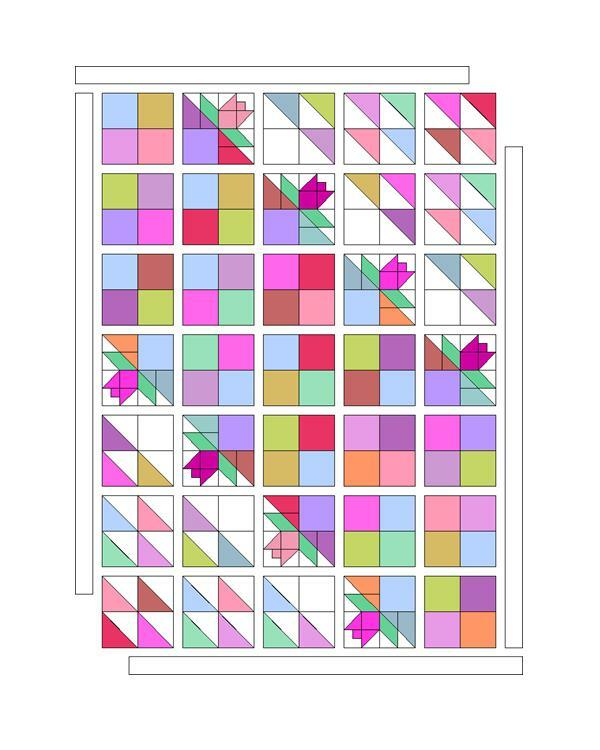 You would need 59 blocks for a generous throw-size quilt – with a border it could be twin-size. 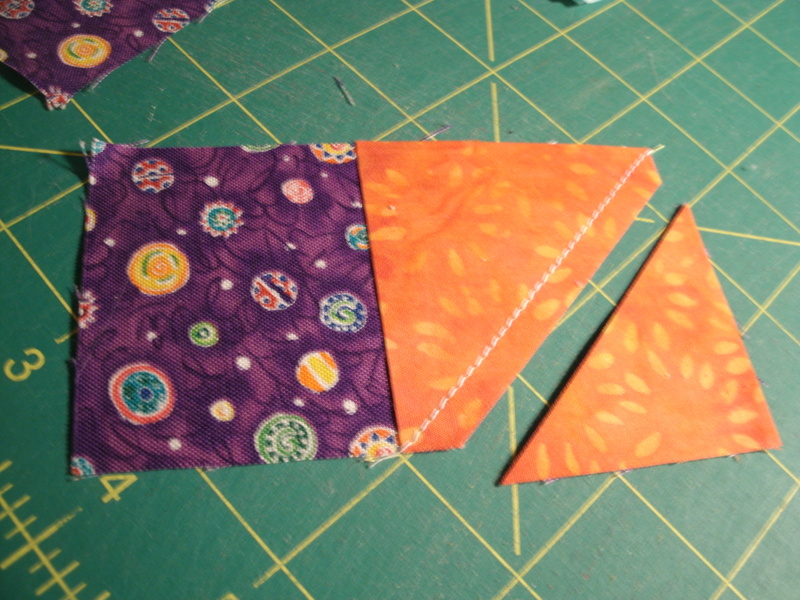 If you need just a couple of matching HST’s, you can pair two 2.5″ x 4.5″ rectangles. Draw a diagonal line from the top left corner to a point 2.5″ in from the left on the bottom edge. Flip the piece around and repeat. 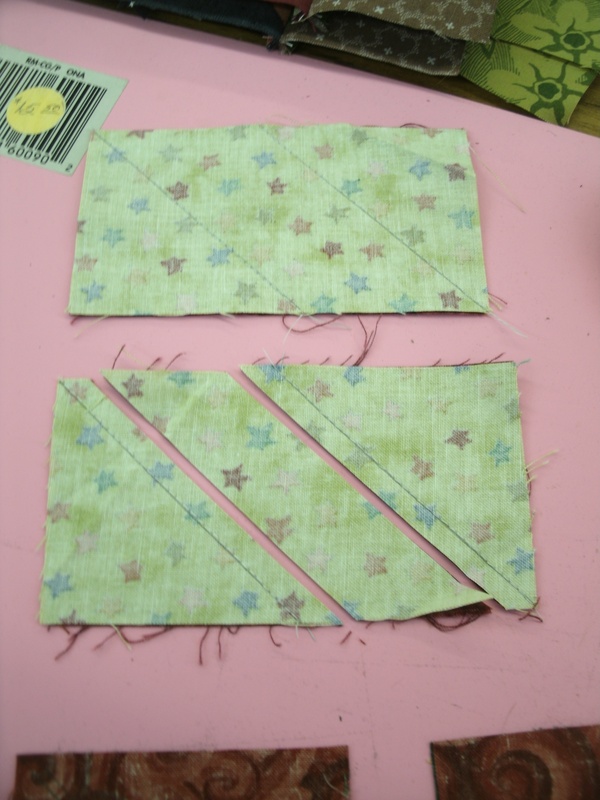 Sew on these diagonal lines and trim 1/4″ from the seams. This gives you two matching HST’s. Need four matching HST’s? 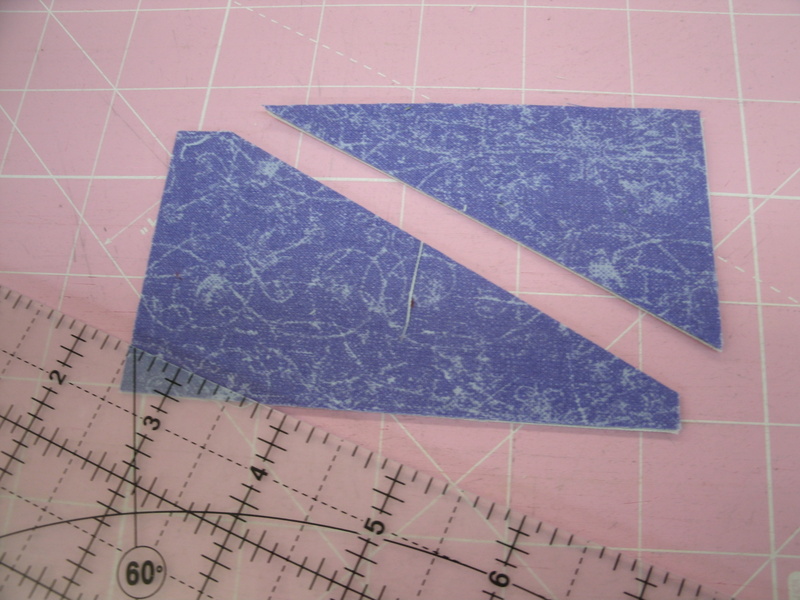 Cut two 3″ squares from two 3.5″ x 6.5″ rectangles. 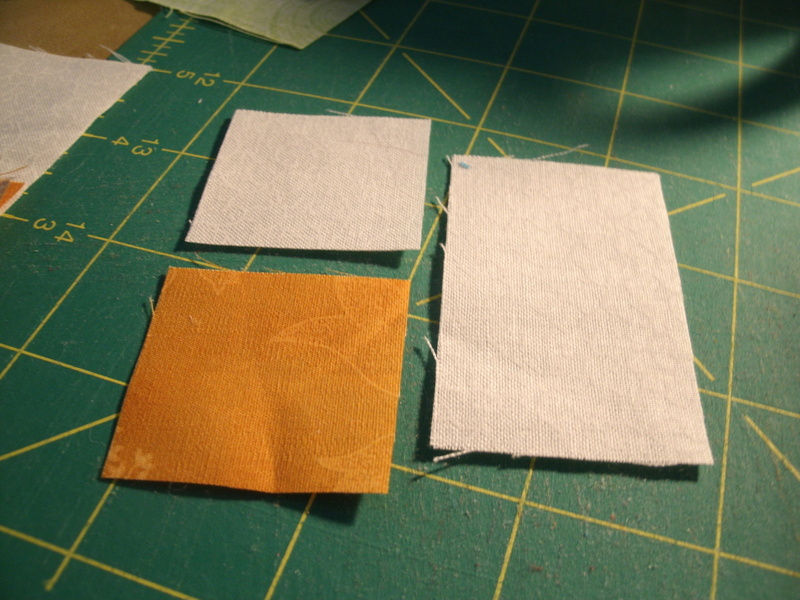 Draw a diagonal line on the back of the lighter squares, sew 1/4″ from the lines and trim on the lines. Now you can trim these HST’s down to 2.5″. If you haven’t already done so, I invite you to join the Thrifty Quilter group on Facebook, and “Like” my Facebook page, Sweetgrass Creative Designs. 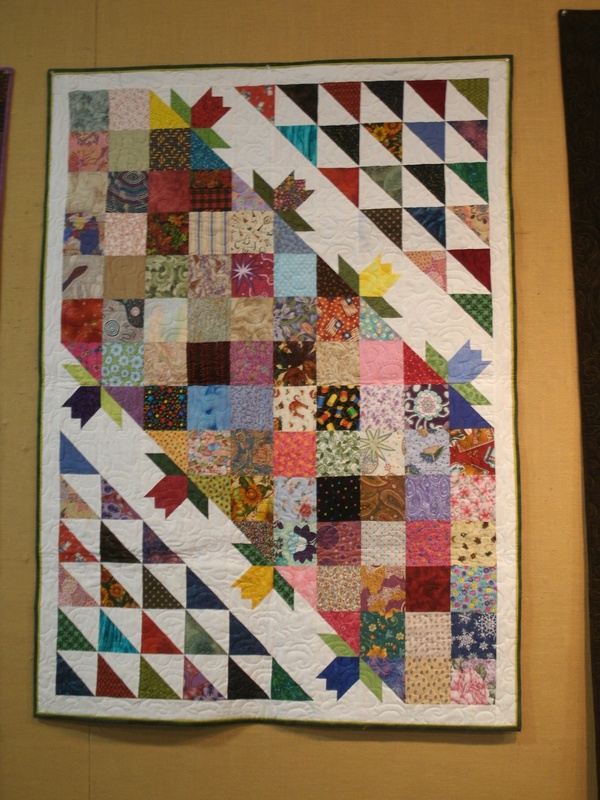 This quilt, which measures 44″ x 60″. was designed and made for my quilt guild’s 5″ charm square challenge a couple of years ago, however, I keep it in my Thrifty Quilter (TQ) collection because those 5″ squares were trimmed down to 2.5″ squares, 4.5″ squares and 2.5″ x 4.5″ rectangles. Cut six 4.5″ x width-of-fabric (WOF) strips and cut eight 4.5″ squares from each strip. Cut three 2.5″ x WOF strips and cut sixteen 2.5″ squares from each. 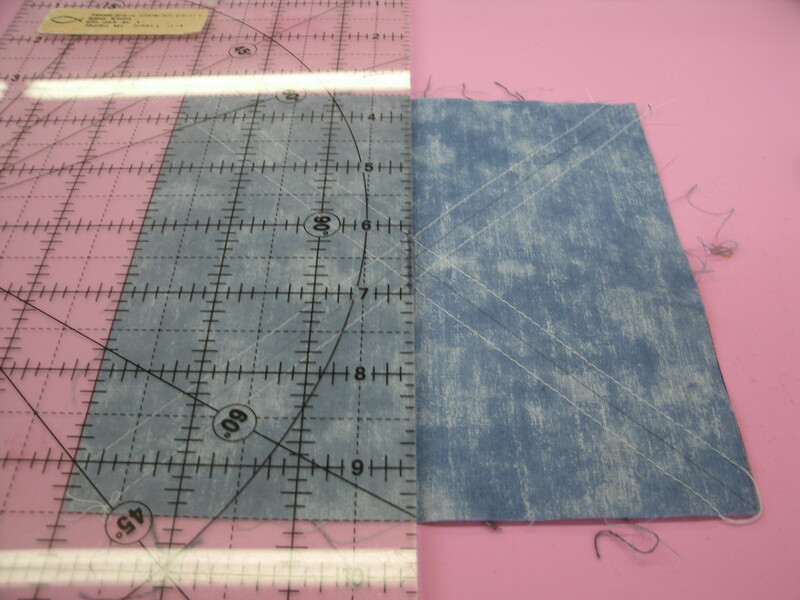 Cut one 1.5″ x WOF strip and cut into eight 1.5″ squares and eight 1.5″ x 2.5″. 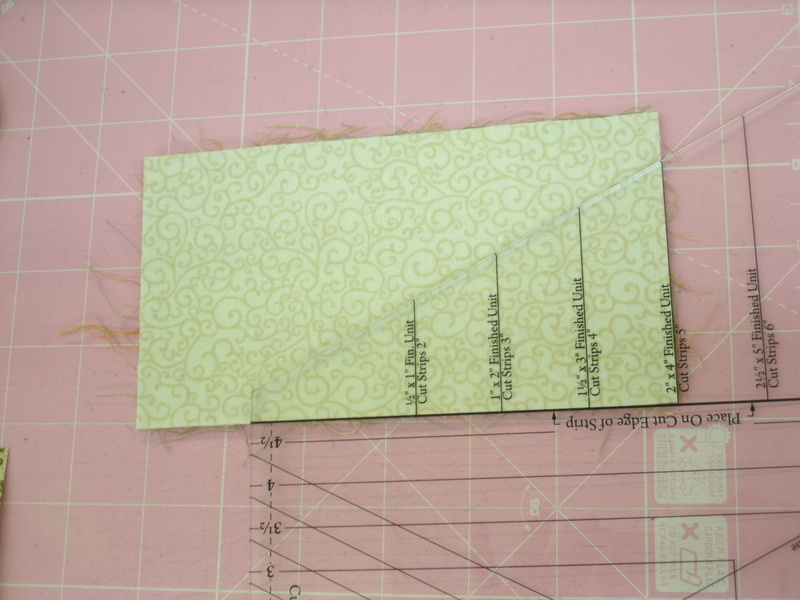 Cut six 2.5″ x WOF strips and set aside for borders. 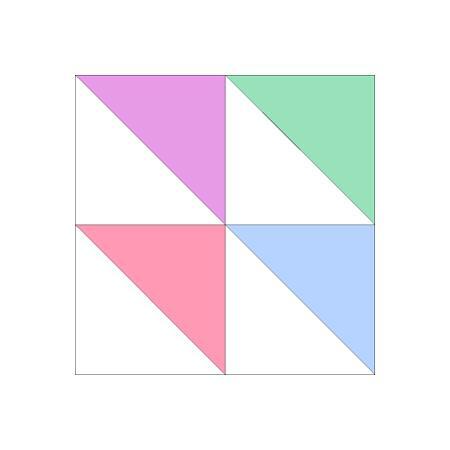 Eight 5″ squares for tulips – cut each square into three 2.5″ squares and one 1.5″ square. Eight green 5″ squares for leaves – cut each into two 2.5″ x 4.5″ rectangles. 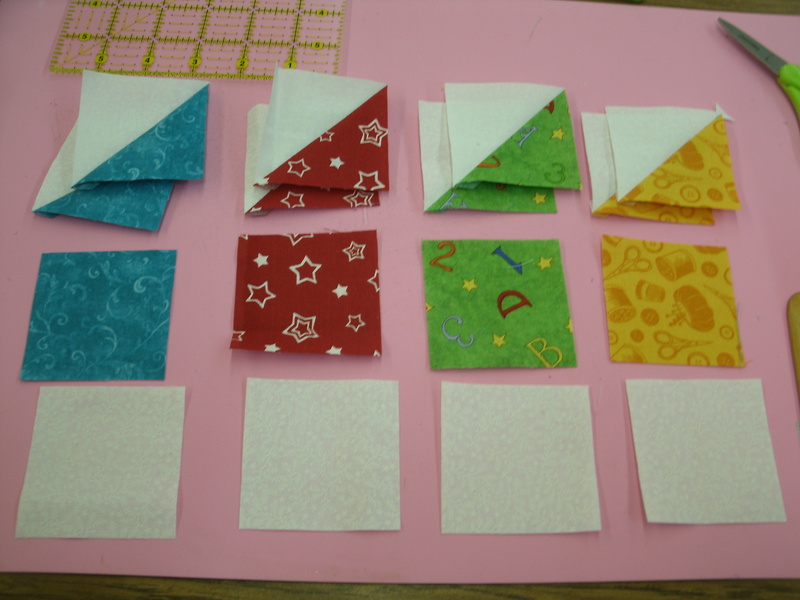 Sixteen assorted 5″ squares – Cut one 2.5″ square and one 2.5″ x 4.5″ rectangle from each. 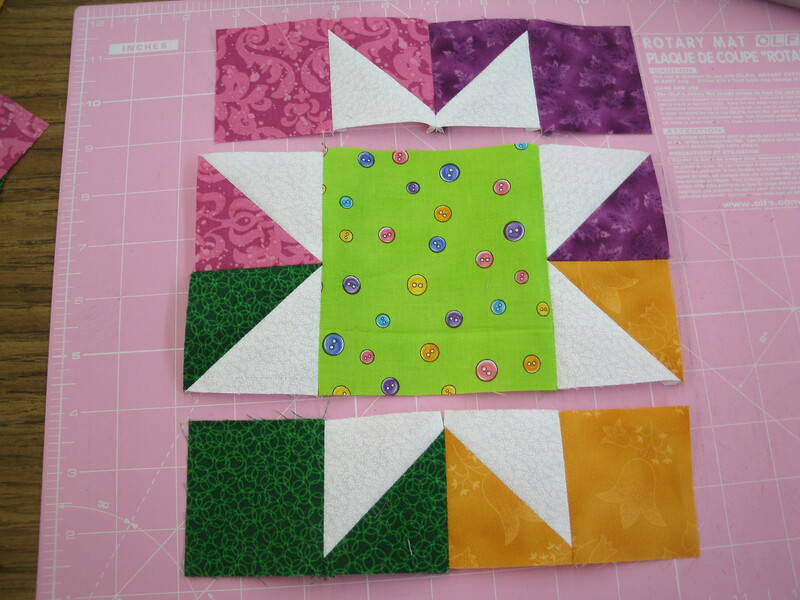 Use 42 of your 4.5″ scrap squares and 42 of the 4.5″ white squares to make 4.5″ Half Square Triangles (HST’s). Don’t toss the cutaway triangles. We’ll use those in another project. 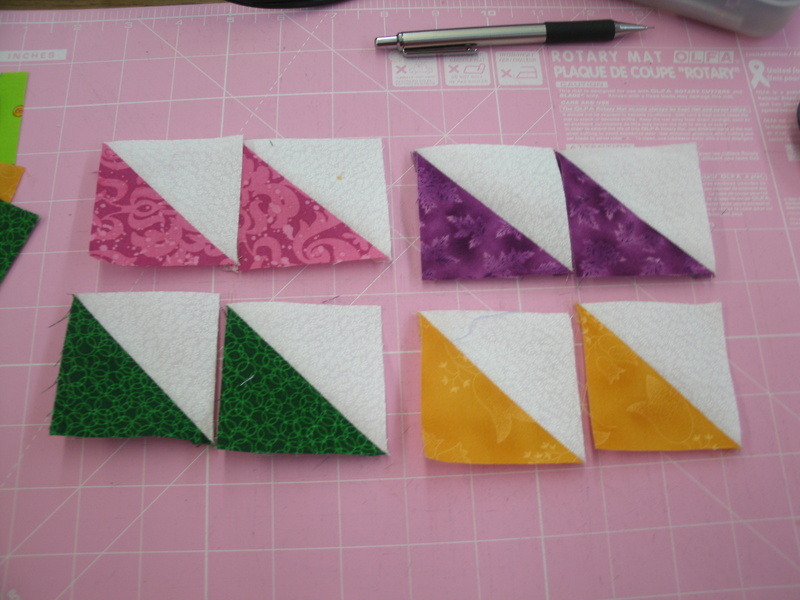 Make six blocks that have four Half-Square Triangles (HST’s). 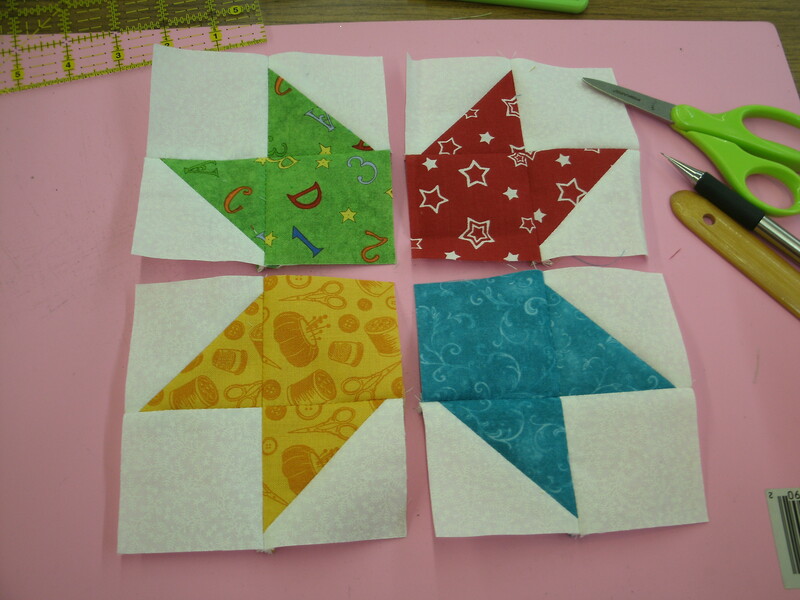 Make six blocks that have three HST’s and one 4.5″ white square. Layout for My Tulip Garden. Sew the blocks into rows, then sew the rows together. Measure the length of your top and use the white 2.5″ x WOF strips to piece two border strips of this length (it should be about 56.5″ long). Sew to the sides of the piece. 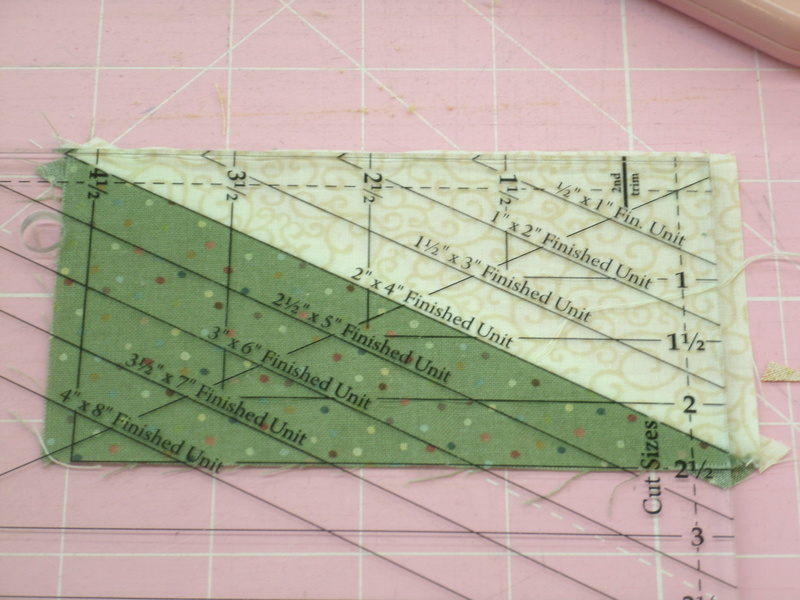 Measure the width, including the side borders (should be about 44.5″) and make your top and bottom borders. The backing for this quilt should be about 48″ x 64″ and the batting should be about the same size. Layer your top, batting and backing and quilt as desired. 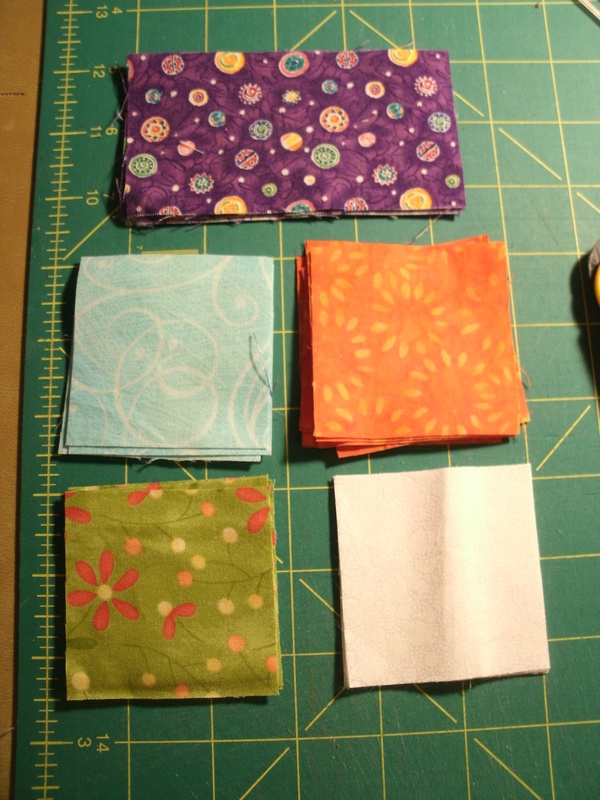 In the next blog, I’ll show you how to make the flanged binding I used for My Tulip Garden. It seems so optimistic to plant tulip bulbs in the face of an oncoming winter as if to remind ourselves that as cold and snowy as the next few months might be, spring is waiting on the other side. Today I’d like to share a tulip block that I used in a quilt I made a couple of years ago for my guild’s Charm Square Challenge. 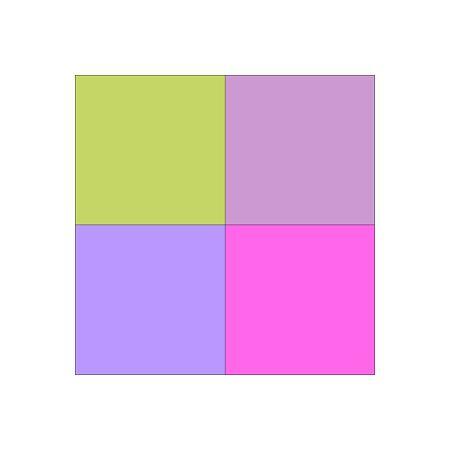 A Charm Square is 5″ x 5″. 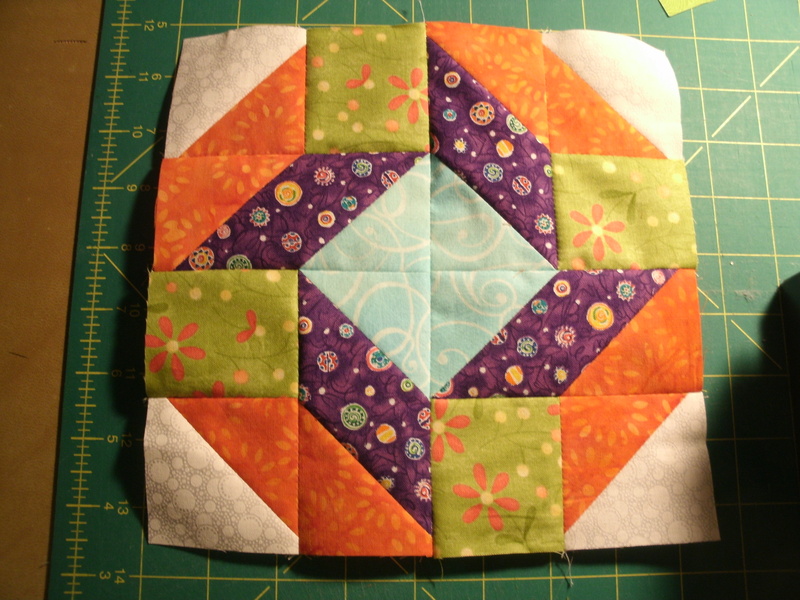 As it happens, this block, and the quilt I’ll show you in the next blog, can also be made with Thrifty Quilter pieces. The tulip block has four sections – the flower, two leaf sections, and a square. 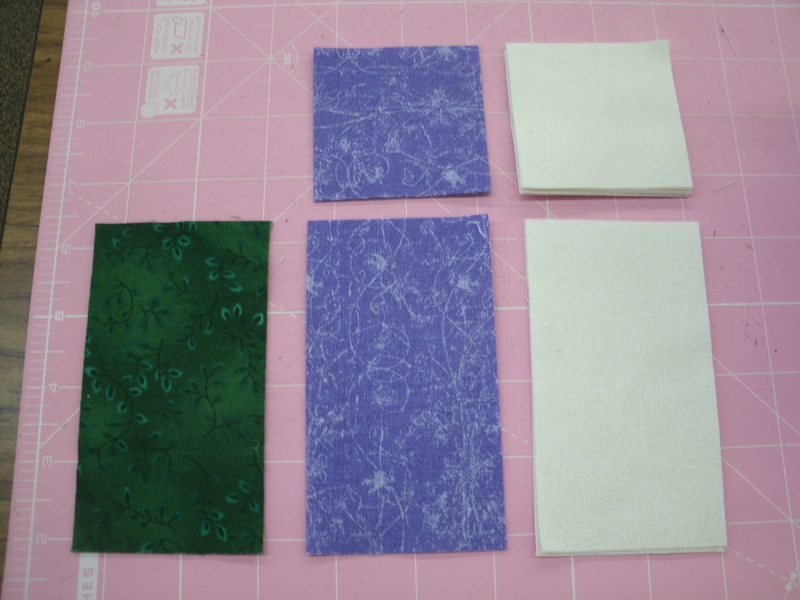 Step 1: sew a 1.5″ colored to a 1.5″ white square, then add a 1.5″ x 2.5″ rectangle. 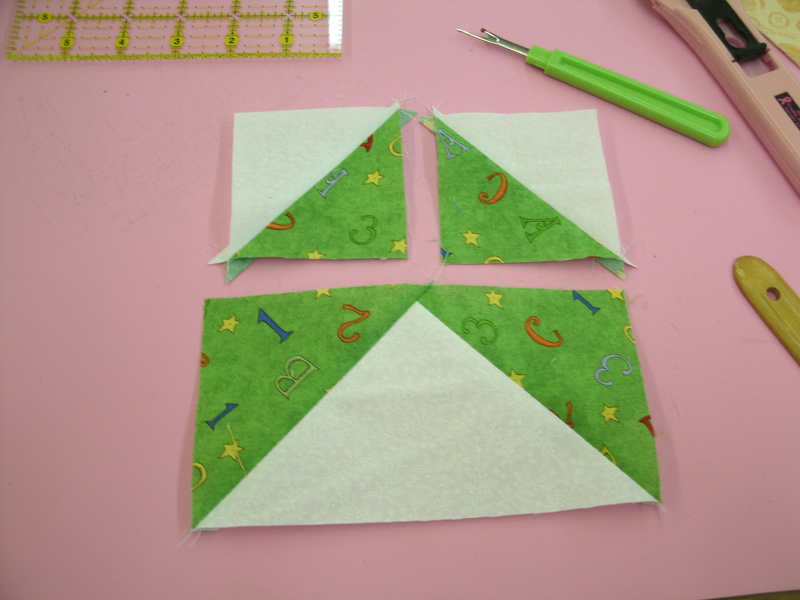 Step 2: You will also need two 2.5″ colored & white half-square triangles, and one 2.5″ colored square. 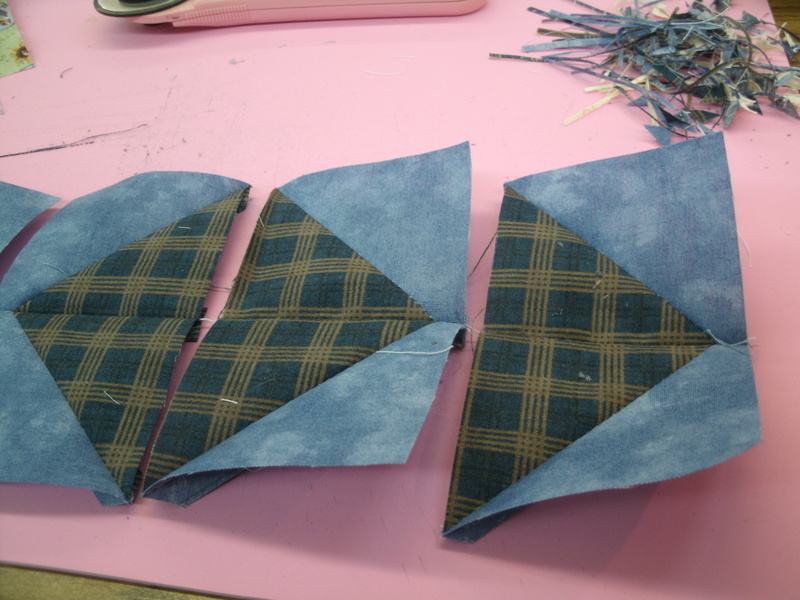 Lay the pieces out as shown and sew together to make a tulip flower. Set aside. Step 3: You will need to make two leaf sections. For each one you need one 2.5″ x 4.5″ green rectangle and two 2.5″ white squares. You also need two matching pieces, one a 2.5″ square and the other a 2.5″ x 4.5″ rectangle. 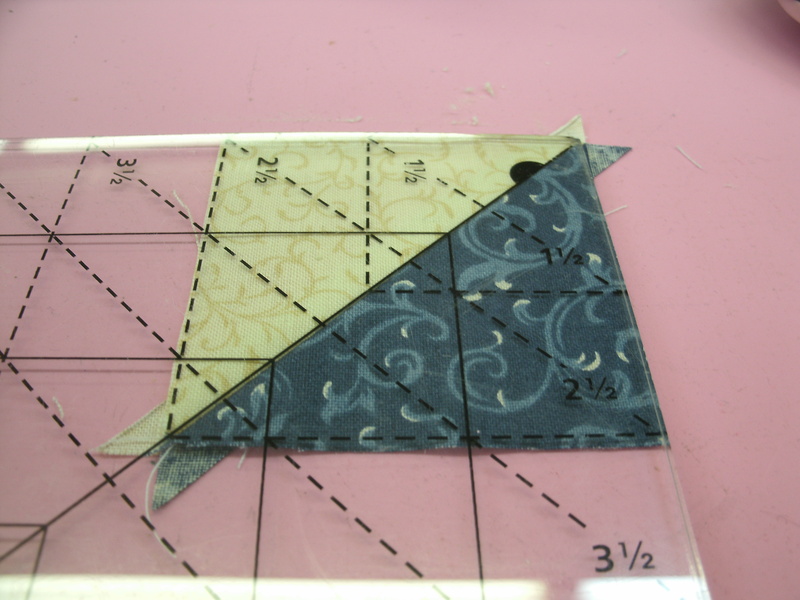 Step 4: Use the “sew and flip” method to make the units shown. Notice that the triangle slant “upward” in the purple units and “downward” in the red units. 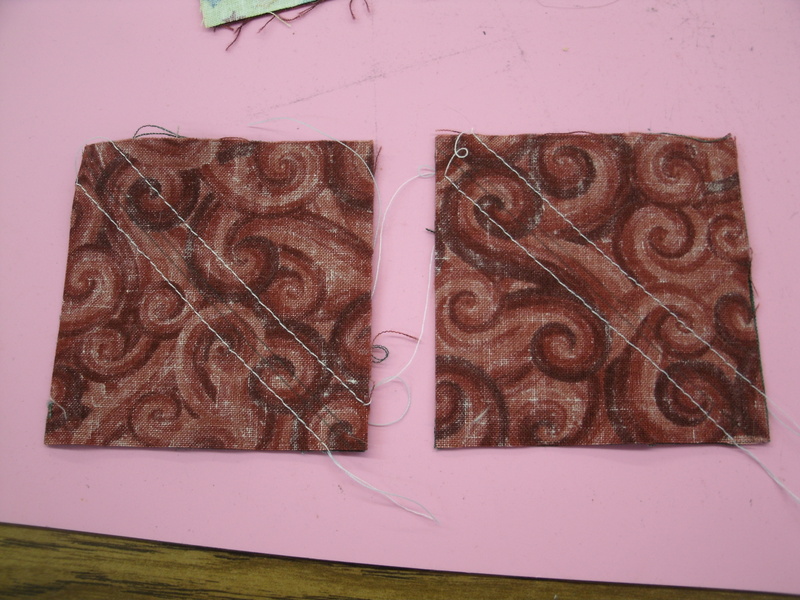 Sew the center seams to complete these units. 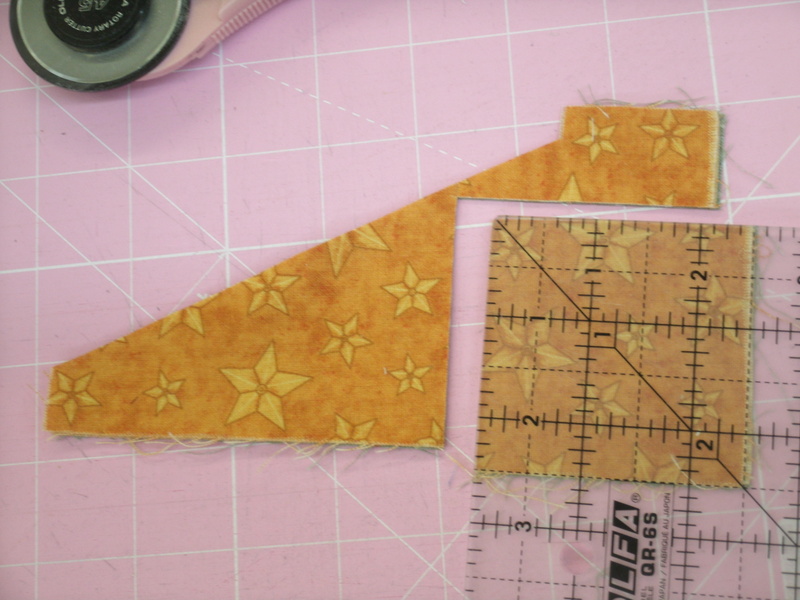 Step 5: Lay the flower section, the leaf sections and a 4.5″ square out as shown and sew together to complete your tulip block. 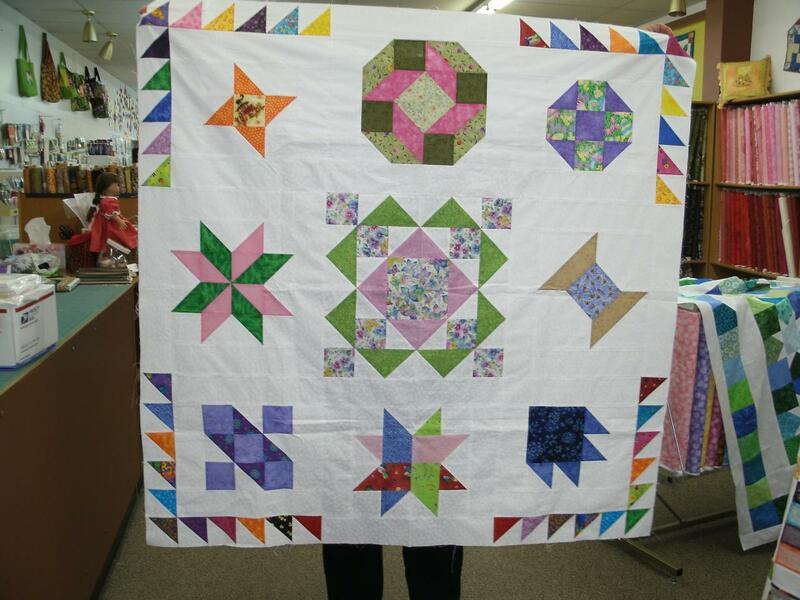 Next time I will show you the quilt I made with these tulip blocks. To make your own, you will need eight tulip blocks. 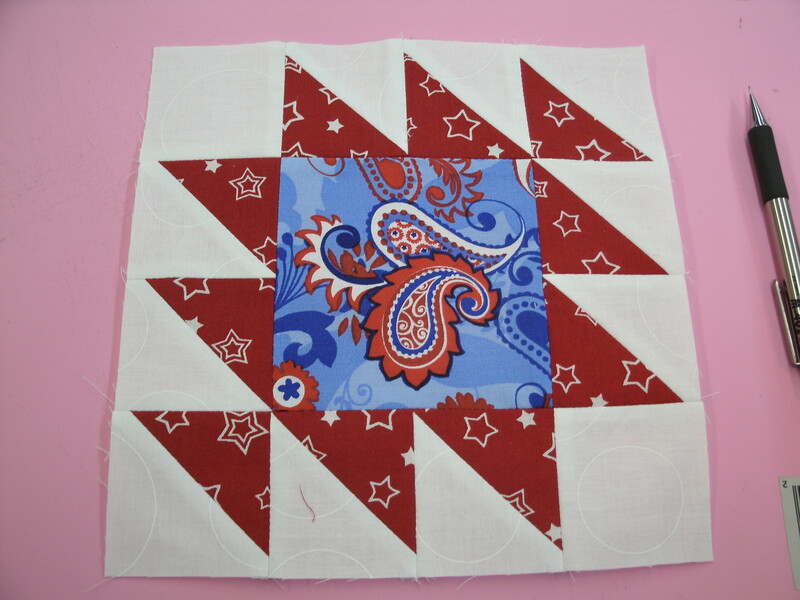 You will also need fifteen 4-patch blocks made with 4.5″ squares. My quilt is 44″ x 60″. 3 yards white for backgrounds. Cut 48 2.5″ squares, 8 1.5″ squares, 8 1.5″ x 2.5″ rectangles, 48 4.5″ squares (or 21 5″ squares & 6 4.5″ squares), 5 2.5″ x width of fabric strips for borders. Scraps: 2 sets of 5 2.5″ squares for flowers, 8 pairs of 2.5″ x 4.5″ green rectangles for leaves, 16 sets of matching 2.5″ squares and 2.5″ x 4.5″ rectangles for the tulip blocks, 60 4.5″ assorted 4.5″ squares for 4-patches. Your will also need 42 more assorted 4.5″ squares or 21 assorted 5″ squares for half-square triangle blocks, which we will make next time.